Summer has arrived! School is out, the sun is shining and the wonderful azure blue waters of the Caribbean Sea are glistening and inviting you to just come and sit for a while. The laughter of the children can be heard and the fragrant essences of the FrangiPani, Roses and Jasmine ignites wonderful memories of easier times in your mind. But the one thing that has been on your mind for more than seven months now is the mangoes that you see ripening on the tree! That sweet, succulent fruit that you know is the true nectar of the gods! Yellow, gold, juicy, sweet, dripping with heavenly goodness and making you feel like you were a child again, climbing the trees to get the largest, sweetest mango on the tree before your friends could get to it. Or waiting and watching and plotting how you will pick that red orange fruit before the birds or iguanas got to it. Getting your crocus bag and making your way either on foot or with a bike to the Rain Forest to climb the multitude of trees just waiting for you to get its sweet, goodness with the true Caribbean delicacy…Mango! There are so many varieties and flavors of mango and they each differ from island to island. I remember as a child going to Jamaica with my mother. As a little girl I would eat and eat and eat mangoes until I couldn’t any more. And I thought that St. Croix had the juiciest and sweetest and largest mangoes…but I was so very wrong. Jamaica. What an island. I think I was there about four days already and we had gone by a relatives home (this was many moons ago). But I remember saying to myself I want to go home. And then…I saw it…a mango that to this little eight year old child was the size of my head! Mind you, I had already been eating mangoes straight from the previous day and I was on a mango high! My mother warned me not to eat any more or else I would loose the taste for mangoes forever. But I didn’t listen. Me! Loose the taste for mangoes forever!? Surely she must be joking. I KNOW she could not have been talking to me because there was not a mango around that I did not eat and did not love and swear my undying fealty towards! And so…mesmerized by the vastness of this great fruit…I took a bite! And it was heaven! I ate and ate and ate. I think I ate about three of them. And then…the unthinkable happened! I became sick! Inside I just knew my mother had done something to me or tricked me to make me now feel sick. It was her fault after all…she was the one who said that I would get sick if I ate too many mangoes! She had blighted me! So there I lay for a whole day with the worse stomach cramps I had ever had…all from eating too many mangoes. No problem I thought. I will get better! And sure enough I did. But it was at a severe cost…I had lost my taste for mangoes! The memory of the pain was enough to scare me for 20 years from eating another mango ever again. Until one day, now with my own children and watching them enjoying climbing the trees as I did as a child and waiting for the first mangoes to drop from the tree…I decided to try one. And it was like rediscovering an old friend! I was instantly and immediately transported back to my childhood and the sweet, sugary goodness of the mango made everything seem right again! But I was wiser this time. I only ate a few each day and I only ate a certain type (I am biased with the grafted variety). But being a Caribbean child, I could not in all honesty say that mangoes would forever be out of my life! That is sacrilege! How could I? So how do I honor this wonderful friend that I have found anew? I share it with the world. For the summer months each year, I offer this special and prized fruit in a line of body care products. The fruit of this amazingly sweet, succulent, sugary fruit is available exclusively in the soaps. You may wonder why, but once you try it then you will know! The fruit adds a silkiness and softness to the soap that is felt immediately on the skin. The butter is used to make the Body Butter, Body Lotion and Body Polish. And the fragrance is carried throughout the entire line of itiba’s skincare line! 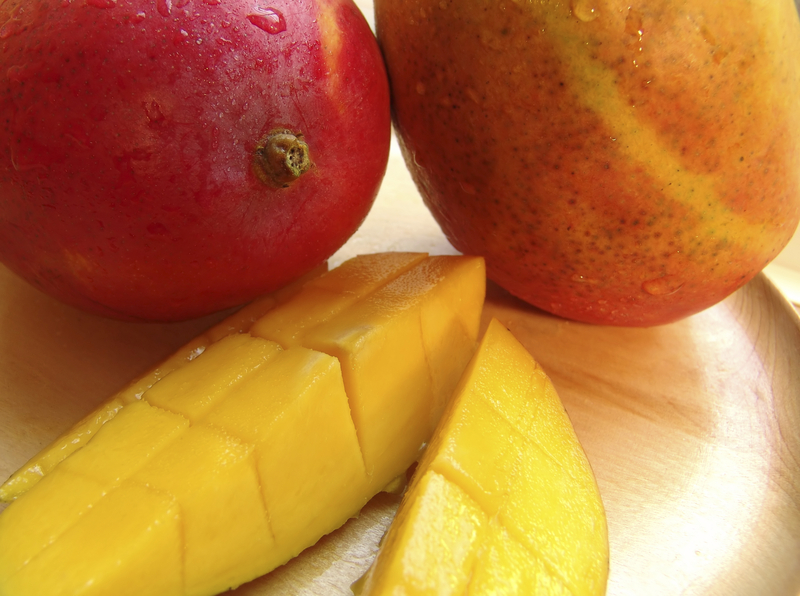 Come…enjoy a little piece of MY Caribbean with Mango products from itiba, LLC!